Griswold Inn Rope and Peg Bed from the collections of the Worthington Historical Society (WHS) may be used for educational purposes as long as it is not altered in any way and proper credit is given: "Courtesy of the Worthington Historical Society, Worthington, OH." Prior written permission of the WHS is required for any other use of Griswold Inn Rope and Peg Bed. Contact WHS at info@worthingtonhistory.org to request permission. Griswold Inn Rope and Peg Bed is realia, with genre furniture. Its dimensions are 59.5 in. high. It was created in 1800. 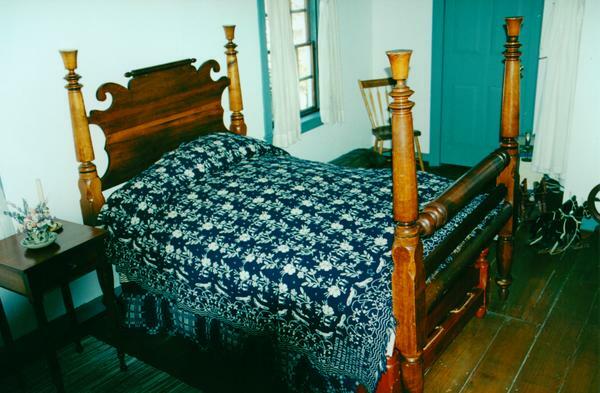 This American maple rope and peg bed came from the Griswold Inn. It is three-quarter size with sugar bucket finials. It is displayed in a bedroom in the 1811 portion of of the Orange Johnson House museum. Early beds used ropes instead of springs to hold up the mattress or ticking. The ticks were usually stuffed with straw, corn husks and sometimes feathers. Travelers slept in their clothes or brought their own sheets. Sheets were a luxury, as doing laundry on the frontier required immense labor. Often people slept two or three to a bed, and private rooms were rare. Ten or twenty people might share a room, and those with no bed would sleep onthe floor. Quiet was an almost unattainable ideal. Most cabins had only one or two rooms, so privacy were not possible. Another problem for frontier travelers was vermin. Lacking modern insecticides and pest control, bedbugs, lice, fleas, rats, mice and mosquitoes plagued the hardy wanderer. Not until midcentury did many hotels in the midwest rise to the standards of the east coast. The Griswold Inn, extant until 1964, was built in 1811 on the north-east Village Green by Worthington founder Ezra Griswold. Its location near the intersection of Granville Road (Rt. 161) and High Street (Rt. 23) made it a popular stopping place for travelers. The Inn featured a fireplace in every room and a large second floor ballroom, which was eventually converted to bedrooms when the Inn reverted to residence of the Griswold family. The building was razed in 1964, despite efforts in the community to save it. It covers the topic Griswold Inn. The Worthington Memory identification code is whs0029.